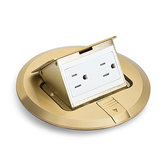 Now featuring the Lew Electric PUFP-BD 6" Brass pop up floor plate with 2 tamper resistant 15 amp decora receptacles. This attractive yet functional floor box, has been designed to provide a sleek, convenient power option as an indoor floor box that provides duplex power in a hidden and aesthetically pleasing pop up. 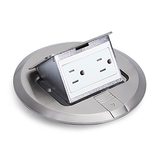 This unit is perfect for both residential and commercial type applications where users would like a hidden power option in an open floor plan type environments that might not have easy access to a wall outlet. The PUFP-BD has the ability to be installed in either wood or concrete floors. Users will need to purchase the appropriate back box depending on the flooring in your installation. After installing your back box, simply run the wire through the knockouts and to the outlet. The PUFP-BD when fully installed in either wood or concrete back boxes is UL listed, as well as cUL recognized for use in Canadian Installations. Easy to clean around - when the pop up is not in use, and the UL compliant lid is closed, the pop up becomes protected from both dust and scrub water.